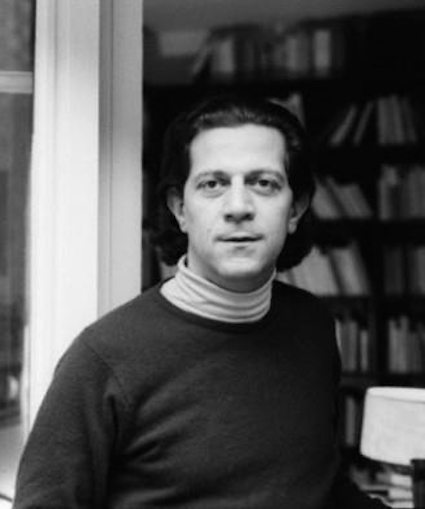 Click for more on Nicos Poulantzas and more by Doug Enaa Greene. August 5, 2015 -- Links International Journal of Socialist Renewal -- We live in an era where too much of the left, both in the USA and abroad, remains stuck to old orthodoxies and failed strategies. Marxism is reduced to holy writ and rote, devoid of any ability to either interpret or change the world. In order to win, the left desperately needs to break away from past habits and recover the ability to raise questions anew by using Marxist methodology to formulate strategy. In this endeavour, there are a number of thinkers we can profitably learn from; one of whom is Nicos Poulantzas. Despite the limitations and contradictions within Poulantzas' methods, he was not afraid to ask the right questions and to develop new strategies. To that end, it is worth looking at Poulantzas' work in three areas: the state, class and the transition to socialism. For more by Doug Enaa Greene, click HERE. August 2, 2015 -- Links International Journal of Socialist Renewal -- The Greek Civil War was one of the major events shaping modern Greek history. The Greek Civil War from 1946-49 was fought between the Communist Party and the monarchy aided by the United States. The Civil War was one of the first major clashes of the Cold War. Communist historian Doug Enaa Greene lectured and led a discussion on the roots and course of the war for the Center for Marxist Education. Fighters of the Greek Army of National Liberation. See a video presentation of this talk at http://links.org.au/node/4537. For more by Doug Enaa Greene, click HERE. In Athens, supporters of the "No" campaign celebrate after the first results of the July 5 referendum. Yannis Kolesids / EPA. April 25, 2015 -- International Viewpoint, posted at Links International Journal of Socialist Renewal -- Events in Greece have taken a dramatic turn, and insolvency is at the gates. On April 20, the Greek government issued a decree forcing local authorities to place cash reserves at the Bank of Greece. Two days later, Dimitris Mardas, the deputy minister of finance in charge of state revenue, declared that €400 million was missing to pay for pensions and salaries at the end of the month. A few hours later, he said the money was found and that he was now trying to constitute cash reserves. But according to sources, Mardas informed SYRIZA members of parliament at a meeting that same day that the state reserves wouldn’t be able to make all payments in May. Crowd at SYRIZA leader Alexis Tsipras' victory speech, January 25, 2015. Photo by Vivian Messimeris/GLW. 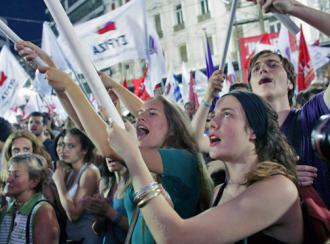 For more discussion and analysis of SYRIZA's victory, click HERE. February 5, 2015 -- Daily Blog, posted at Links International Journal of Socialist Renewal -- The longer the SYRIZA government can survive and resist the better chance working people throughout Europe can act to remove right wing austerity governments and mobilise their own power through their unions and communities to create an alternative to the Europe of capitalism, recession and despair. 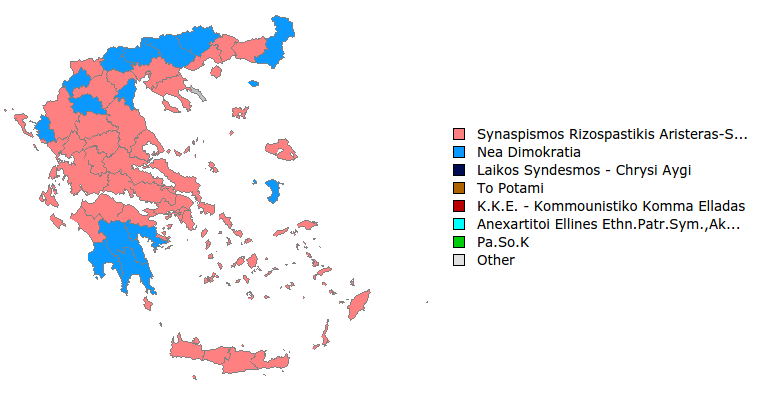 February 5, 2015 -- Transform!, posted at Links International Journal of Socialist Renewal -- The first projections already revealed that the Greek election on January 25, 2015, would lead to a fundamental change of political direction. This turned out to be true even though the goal of achieving an absolute majority was just missed. 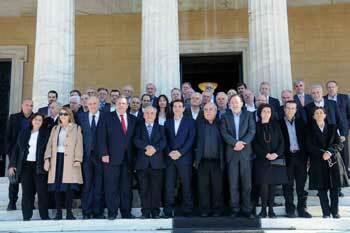 Instead of the required number of 151 parliamentarians, SYRIZA won 149 out of 300 deputies in the parliament (Vouli). SYRIZA leader Alexis Tsipras makes his victory speech, January 25, 2015. Photo by Vivian Messimeris/GLW. January 30, 2015 – Links International Journal of Socialist Renewal -- It was the French Catholic daily La Croix that last week best described the size of the challenges facing Greece’s incoming SYRIZA government—they are “labours of Hercules”, a reference to the mythical Greek hero whose 12 feats against impossible odds made him immortal in the ancient world. SYRIZA: 149 seats, 36.5%; New Democracy: 76 seats, 27.8%; Golden Dawn: 17 seats, 6.3%; To Potami: 17 seats, 6.1%; KKE: 15 seats, 5.5%; Independent Greeks (ANEL): 13 seats, 4.7%; PASOK: 13 seats, 4.7%; others not elected: 8.6%. January 27, 2015 -- Green Left Weekly and Links International Journal of Socialist Renewal -- The victory of SYRIZA, Greece’s Coalition of the Radical Left, in the January 25, 2015, general election caused enormous outpouring of joy on the streets of Athens and confirmed general expectations.The final result was 36.49% and 149 seats. SYRIZA will now form government in alliance with the socially conservative, but anti-Brussels, Independent Greeks. The “poll of polls” done just the day before the election had SYRIZA winning 37.5% and 146 seats. Exit polls taken after voting closed had SYRIZA at between 36.5% and 38.5% (146-158 seats in the 300-seat Greek parliament). In the end, the radical coalition fell two seats short of an absolute majority. 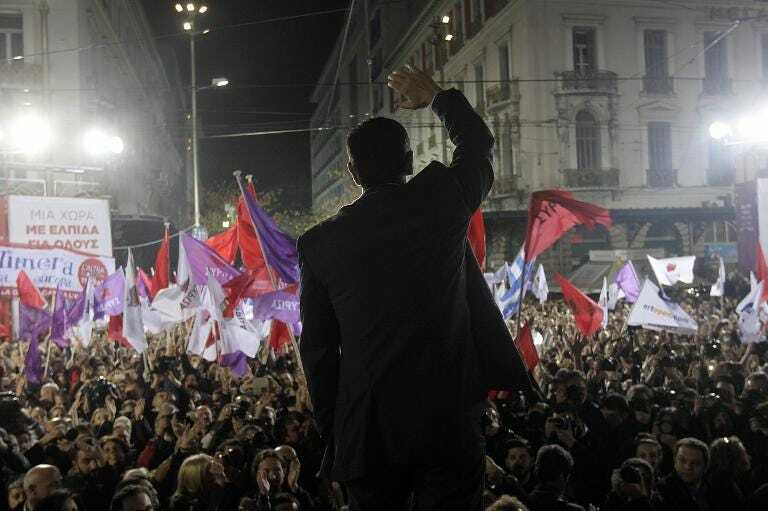 SYRIZA's closing election rally, Athens, January 22. Click HERE for more on SYRIZA and the election in Greece. 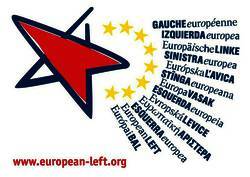 January 22, 2015 -- New Left Project, posted at Links International Journal of Socialist Renewal -- It would have been unthinkable just a few years ago, but a party of the radical left is on the cusp of power in an EU country. The latest opinion polls indicate that SYRIZA will triumph in the Greek national elections to be held on January 25 and although it may not win an absolute majority in parliament it would (assuming it can find coalition partners) certainly be the dominant force in any coalition government that emerged. Click HERE for more on SYRIZA. January 20, 2015 -- Socialist Worker (USA), posted at Links International Journal of Socialist Renewal -- The Coalition of the Radical Left, or SYRIZA, is favoured to win parliamentary elections on January 25, giving it a strong chance to form a new government that could confront the catastrophic austerity agenda that has plunged Greece into severe economic and social crisis. Here, Lee Sustar answers your questions about the rise of SYRIZA and what a victory for it on January 25 would mean. Why is so much attention focused on the Greek elections? Greece: If SYRIZA wins the election, what might happen next? December 2014 -- Red Pepper, posted at Links International Journal of Socialist Renewal with permission -- With Greece facing a snap general election on January 25, 2015, there is the genuine prospect of a radical left government coming to power in a European Union country. SYRIZA, a party born from a coalition of Eurocommunists, the far left, social movements and anti-globalisation activists, is riding high. The general sentiment among SYRIZA officials and activists is that they will win the election and form the next government. The party won the European election in May 2014 and achieved some significant wins at the regional elections. It has been leading nationwide polls for months, scoring 29 per cent in late December 2014. The majority-friendly electoral law allows for an absolute majority at 35 to 40 per cent of the vote, depending on the number of parties passing the threshold. Alexis Tsipras addresses the SYRIZA congress. 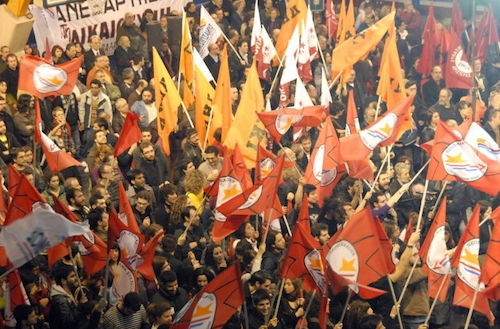 July 18, 2013 -- Contretemps via International Viewpoint -- This article reflects on the founding congress of Syriza as a political party, rather than a coalition of fourteen organisations, which took place on 10-15th July 2013. Un Congreso que ha transformado a la izquierda griega Durante el fin de semana del 10-14 de julio, en el primer congreso de Syriza (Coalición de la Izquierda Radical), era obvio que la historia se estaba escribiendo continta indeleble. Este ha sido el congreso que cambió a la izquierda griega. Ante el reto de sus perspectivas de crecimiento, que le abren la puerta de un futuro gobierno, la coalición de izquierda tomó la decisión de convertirse en un partido. Y ello explica la dinámica de este primer congreso, en el que todo se ha puesto sobre la mesa: desde los principios fundacionales hasta la orientación política y los estatutos. Y, por su puesto, en el que todo se ha discutido y clarificado las diferentes posiciones, siempre con una pasión típicamente griega. Syriza congress: Alexis Tsipras (left), Manolis Glezos. See also Helena Sheehan's "To the crucible: An Irish engagement with the Greek Left" published in January, 2013. For more on Syriza, click HERE. July 29, 2013 -- Irish Left Review, posted at Links International Journal of Socialist Renewal with the author's permission -- “Things have gone very quiet in Greece, haven’t they?” So many people said that to me in the past six months or so. I responded that there was a lot going on, even if international media weren’t covering it. There were civil mobilisations of teachers and transport workers, as well as rising unemployment, emigration and impoverishment, being met with continuing protest, strikes, occupations. Even so, I sensed a lull in the rhythm of resistance, since the big demonstrations opposing the passage of the third memorandum last autumn. Obviously people couldn’t keep going at that pitch all the time, but how many were succumbing to exhaustion, despair, defeat? How many were quietly going about their work in solidarity networks, policy development, political education? Alexis Tsipras addresses the congress. 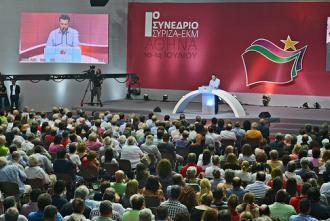 The following speech was presented by party leader Alexis Tsipras to the Syriza (Coalition of the Radical Left) first national congress on July 13, 2013. One of the major decisions to be made at the congress was the question of forming a single united left party from the many left organisations that to that point operated as part of the coalition. Click HERE for a report on the congress. Do you know what the message from the outside is? The message from an agonising and fighting society, with all the things that are going on in it? The message is: get done or we’re done for. We’re watching you, we’re waiting for you, but we’re running out of time. The message is: it’s now or never. The message is not just political: SYRIZA or memoranda. The message is: SYRIZA or humanitarian catastrophe. Because those shameless appointees of the lenders, those executors of the memoranda implementation, they have no shame at all. They have no respect or pity for anything or anybody. May 10, 2013 -- Left Unity, posted at Links International Journal of Socialist Renewal with Murray Smith's permission -- Having followed with sympathy the emergence of Left Unity and the possibility of a new party of the left being launched, I read with interest the two-part article by an anonymous figure, who may or may not be called Michael Ford, which may or may not be a pseudonym. I’m sure we’ll find out. For the purposes of this article, I will refer to him as Ford. In any case, whoever wrote it, the aim of the article is clearly to try and discredit the perspective of building a new party to the left of Labour and validate that of working with/within the Labour Party to drive it to the left. There will undoubtedly be many replies to Ford from people who are directly involved in politics in Britain, which I am not at present. However, an important part of Ford’s argument is to try and demonstrate that the political forces to the left of social democracy in Europe don’t amount to much, either politically or in terms of their support. In doing so, frankly, he paints a picture which has little relation to reality. This is what I want to take up . Syriza poster, Synaspismos office in Athens, Helena Sheehan on the streets with Syriza in Athens. January 21, 2013 -- Irish Left Review, posted at Links International Journal of Socialist Renewal at the author's suggestion and with her permission -- A monumental drama is playing out before our eyes. It is a true Greek tragedy. The plot: A society is being pushed to its limits. The denouement is not yet determined, but survival is at stake and prospects are precarious. Greece is at the sharp end of a radical and risky experiment in how far accumulation by dispossession can go, how much expropriation can be endured, how far the state can be subordinated to the market. It is a global narrative, but the story is a few episodes ahead here. SYRIZA rally. Photo by SYN Flickr. November 18, 2012 – Links International Journal of Socialist Renewal, originally published as six notes at PolEcon.net. Republished here with Paul Kellogg’s permission.-- An economic crisis of enormous proportions has erupted in a first world country in the global North. The scale of the economic crisis in Greece has few modern equivalents, and is at the root of a massive social and political upheaval. Navigating that crisis poses difficult challenges for the social movements in Greece, and has important lessons for activists around the world. The article that follows is an attempt to provide information that can assist those, unfamiliar with the situation in Greece, in navigating this situation.